Brussels is full of talented people - in business, government, civil society - but if you attend a conference, meeting or lecture you're likely to find only a quarter of the speakers are women. What's more, about a third of high-profile events in the city last year had no female panelists at all, according to the team behind the Brussels Binder, who are setting up a free publicly accessible online database to help tackle the "mysterious absence of women" in the Brussels policy debate. The idea began 18 months ago when a group of women experts, mostly working in foreign policy and fed up of seeing all-male panels, got together to work on a solution. "The (conference) organisers themselves kept giving the excuse that there were no women who could speak on specific subjects ranging from cyber-security to energy to defence to environmental politics - and we knew these women, they were our cohorts, our colleagues," says Jacqueline Hale, one of the project's backers. "Why were we not able to find them?" The name Brussels Binder is a tongue-in-cheek nod to a comment by 2012 US Republican presidential candidate Mitt Romney, who said he had "binders full of women". Important plans and policies are debated at conferences to set the agenda for Europe’s future. "When only men speak to issues like war and conflict and threats to security, they bring their own perspectives and they shape and form future actions," Hale says. "This isn't a vanity project by any means - this is a really important endeavour to promote more diverse decision-making and actions out there in the world." 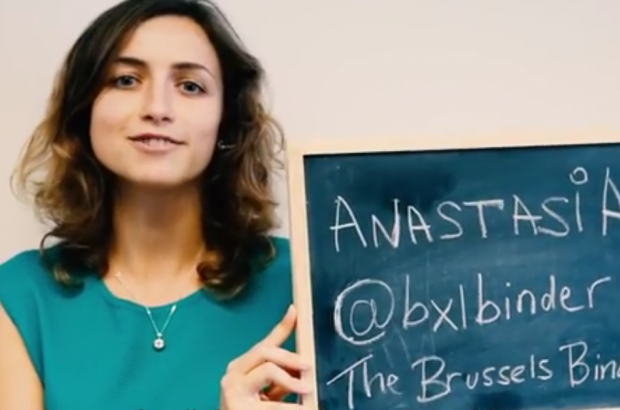 The Brussels Binder team have raised more than €8,000 through crowdfunding in the past month, with 153 backers pledging their support. The money will go to building the website and keeping it up-to-date. A fundraising event will take place today (Monday 20 March) at Google's Brussels office, on Chaussée d'Etterbeek, from 18.00-21.00. Working smack at the electrifying intersection of art and activism, Myriam Arseneault-Goulet, Loraine Furter, Sarah Magnan and Mia Melvær want to improve the representation of women in new media and online sources of knowledge tools such as Wikipedia. Recording and documenting history has traditionally been the purview of white, old men, the four women behind the one-year-old Brussels collective Just for the Record, say – nothing new there. What has changed however is the wide range of opportunities and tools for people who don't fit that description to also start making that most critical of executive decisions: who and what is considered worth recording for future generations? "There's so much potential in the tools we see today," Melvær says, "but this potential isn't being utilised. That's why people should care about this." Just for the Record organised a dozen events in 2016, addressing issues of representation in everything from film to the challenges of gender-neutral writing. The name of the collective, which comprises two visual artists and two graphic designers, aptly summarises the mission it is on. "Just for the record, women were present in history, and this and this has happened but you might have missed it," Melvær explains. "History books are still written today, mostly by men and about men, so we think it's super important to break this kind of vicious circle," Furter adds, noting that this trend also applies to newer media tools such as Wikipedia. According to figures from the Wikimedia Foundation, no more than 16% of its contributors identify as women. According to the Just for The Record organisers, the prevalence of men results in skewed entries on the website, which is among the top seven most-visited sites in the world, with some topics not covered at all, and others covered from a male perspective. To date, a Wikipedia entry for "heroine" still does not exist. Users who enter "heroine" into the search bar are instead redirected to the page for "hero". This type of gender bias matters because it is becoming an endless echo chamber, according to the four artists, who all live in Brussels and were friends before launching this project. The lack of, say, entries on female directors for instance creates the appearance that there simply are fewer of them. Furter notes that this absence is sometimes justified in some circles with the argument that "there were no women and we never hear of them", when in fact the more accurate answer is that there are women but "we never hear or read about them, still today". The collective is organising a series of events throughout March. With the events, they want to both highlight and offer a corrective to the stubborn gender bias in both traditional historical records and more upstart formats including Wikipedia. The first event, which took place on International Women's Day at the Royal Library of Brussels, was part of a series of workshops simultaneously organised around the world called Art+Feminism that teach attendees how to contribute entries about female artists and art by women. Attended by close to 50 participants, 63 edits were made, 16 articles were edited and two articles created during the Brussels event. Two additional events will be organised in March: one will focus on collective memory with researcher and lecturer Caroline Godart. The second, full-day event will explore the challenges faced by queer and feminist libraries and archives, together with Rosa, the Brussels documentation centre for feminism and gender issues.